Our mission is to deliver a higher than average standard of service to our customers and our employees, and to further educate those we serve. 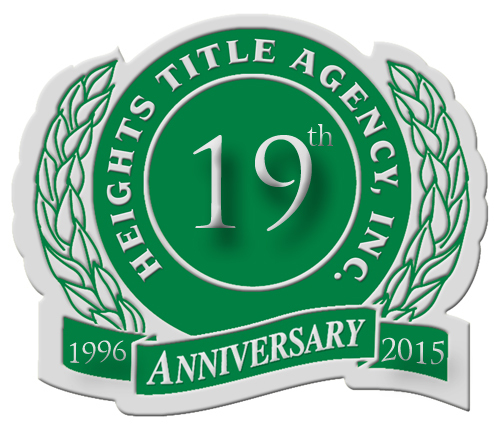 There are three visions that form the foundation of Heights Title Agency- Quality, Integrity, and Commitment. We strive to provide efficient care which allows us to excel in service. This ensures that Heights Title Agency's quality in the real estate title industry underlies every decision. 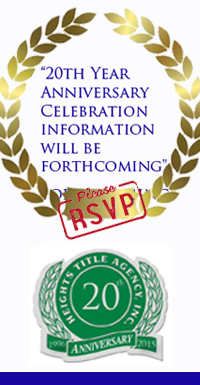 Heights Title Agency, Inc. would like to thank its customers for helping us achieve great success over the years! We strive to give our customers nothing less than the best in service. Our standards of integrity and ethics in handling your transactions will help our continued growth and longevity. Heights Title Agency, Inc. Diligently works on beating our competition in areas of service and special care in our customer relations.